Let the “Good News” be heard in all the Nations. Let us provide compassionate encouragement to the hopeless. Demetrios Kastaris “Exalting the LORD” with the Trombone! Demetrios has received formal training on the tenor trombone and bass trombone all of his life. He also praises the Lord with the Biblical Shofar and numerous conch shells of various sizes and pitches. CD Cover Art – Stylized painting of Demetrios Kastaris by his brother, fine artist, Euripides “Rip” Kastaris. Panoramic view of Jerusalem, The Holy City, City of Peace, City of David, City of Gold, City of Zion. Hallelujah! Praise the Lord! ¡Aleluya! ¡Alabado sea el Señor! Texto escrito y preparado por Demetrios Kastaris. Traducción y edición al español por Alí Bello. Editado y grabado en español por John Diaz. Το σχεδιο Σωτηρίας των Καλών Νέων, συγγγραφή και προετοιμασία απο τον Δημήτριο Καστάρη, Μεταφραση , επεξεργασία και επιμέλεια στη Μοντέρνα Ελληνική Γλώσσα απο τον Ποιμενα της Αθηνας, Ελλάδας, Γεωργιο Τόλια. План Спасења је написао Димитрис Кастарис. Превод и лектура на српски језик – Даниел Станковић. Глас поруке и музику – (соло Флаута) снимио Даниел Станковић. 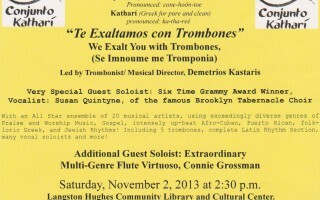 "The CD recording of "Te Exaltamos con Trombones" by Demetrios Kastaris is music at it's best! This recording features everything that makes music art, excellent songs, great arrangements, and superb performances by all of the singers and musicians. It is a truly inspiring effort. 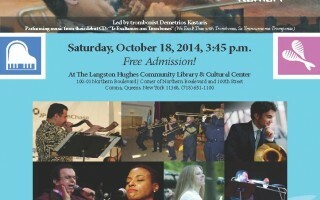 Congratulations to Demetrios and everyone involved." "Demetrios Kastaris’ Conjunto Katharí is vibrant and vital, positive and uplifting, in short, everything that music should be. 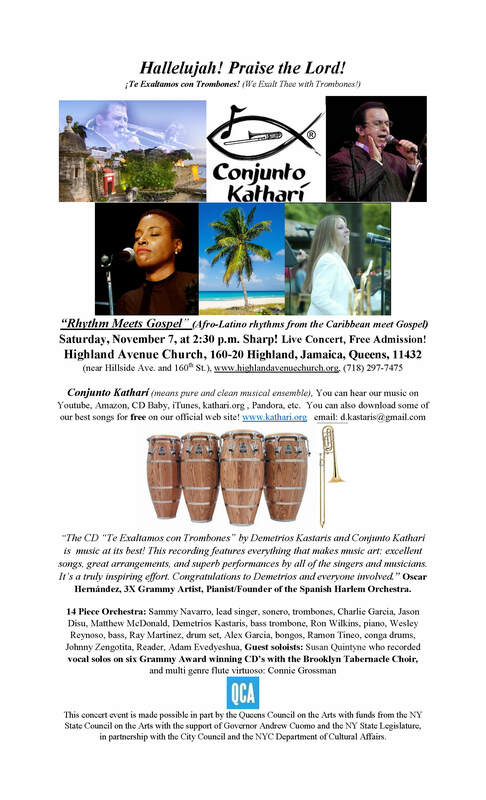 If, in the words of the late saxophonist Albert Ayler, “music is the healing force of the universe,” then Conjunto Katharí is therapy for the mind, the body, and the soul." "Conjunto Kathari - is a unique Gospel Salsa aggregation that successfully balances the essence of African American Gospel roots and Latino elements in its own unique blend. 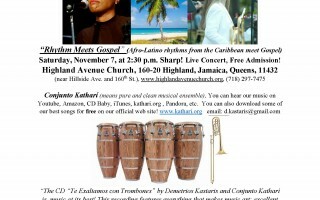 After experiencing them perform at Flushing Town Hall I was both impressed and uplifted by their spirit filled performance"
"This might be the first time I've ever seen a band that performs Gospel Salsa however, I found it interesting and enjoyable. Conjunto Kathari was impressive and I see potential with the group and sound. I am always interested in hearing our music in different ways and with a message"
Cras dictum. Maecenas ut turpis. In vitae erat ac orci dignissim eleifend. Nunc quis justo. Sed vel ipsum in purus tincidunt pharetra. Sed pulvinar, felis id consectetuer malesuada, enim nisl mattis elit, a facilisis tortor nibh quis leo. Sed augue lacus, pretium vitae, molestie eget, rhoncus quis, elit.